Have sufficient RAM available (RamFilter). Have sufficient disk space available for root and ephemeral storage (DiskFilter). Satisfy any architecture, hypervisor type, or virtual machine mode properties specified on the instance's image properties (ImagePropertiesFilter). Do not configure service_down_time to be much smaller than scheduler_driver_task_period; otherwise, hosts appear to be dead while the host list is being cached. For information about the volume scheduler, see the Block Storage section of OpenStack Administrator Guide. When evacuating instances from a host, the scheduler service honors the target host defined by the administrator on the nova evacuate command. If a target is not defined by the administrator, the scheduler determines the target host. For information about instance evacuation, see Evacuate instances section of the OpenStack Administrator Guide. If a host belongs to an aggregate and the aggregate defines one or more metadata that matches an image's properties, that host is a candidate to boot the image's instance. Ensures that the tenant (or list of tenants) creates all instances only on specific Host aggregates and availability zones. If a host is in an aggregate that has the filter_tenant_id metadata key, the host creates instances from only that tenant or list of tenants. A host can be in different aggregates. If a host does not belong to an aggregate with the metadata key, the host can create instances from all tenants. This setting does not isolate the aggregate from other tenants. Any other tenant can continue to build instances on the specified aggregate. This filter passes hosts if no instance_type key is set or the instance_type aggregate metadata value contains the name of the instance_type requested. The value of the instance_type metadata entry is a string that may contain either a single instance_type name or a comma-separated list of instance_type names, such as m1.nano or m1.nano,m1.small. For information about how to use this filter, see Host aggregates and availability zones. See also TypeAffinityFilter. Only schedules instances on hosts if host has the exact number of CPU cores. Only schedules instances on hosts if host has the exact amount of disk available. Only schedules instances on hosts if host has the exact number of RAM available. Filters hosts based on properties defined on the instance's image. It passes hosts that can support the specified image properties contained in the instance. Properties include the architecture, hypervisor type, hypervisor version (for Xen hypervisor type only), and virtual machine mode. Filters hosts based on the NUMA topology that was specified for the instance through the use of flavor extra_specs in combination with the image properties, as described in detail in the related nova-spec document. Filter will try to match the exact NUMA cells of the instance to those of the host. It will consider the standard over-subscription limits each cell, and provide limits to the compute host accordingly. Filters hosts based on their trust. Only passes hosts that meet the trust requirements specified in the instance properties. Dynamically limits hosts to one instance type. An instance can only be launched on a host, if no instance with different instances types are running on it, or if the host has no running instances at all. The following sections describe the available cell filters. Schedules the instance on a different cell from a set of instances. To take advantage of this filter, the requester must pass a scheduler hint, using different_cell as the key and a list of instance UUIDs as the value. Filters cells based on properties defined on the instance’s image. This filter works specifying the hypervisor required in the image metadata and the supported hypervisor version in cell capabilities. Filters target cells. This filter works by specifying a scheduler hint of target_cell. The value should be the full cell path. If cells are used, cells are weighted by the scheduler in the same manner as hosts. [DEFAULT] ram_weight_multiplier By default, the scheduler spreads instances across all hosts evenly. Set the ram_weight_multiplier option to a negative number if you prefer stacking instead of spreading. Use a floating-point value. [DEFAULT] scheduler_host_subset_size New instances are scheduled on a host that is chosen randomly from a subset of the N best hosts. This property defines the subset size from which a host is chosen. A value of 1 chooses the first host returned by the weighting functions. This value must be at least 1. A value less than 1 is ignored, and 1 is used instead. Use an integer value. [DEFAULT] scheduler_weight_classes Defaults to nova.scheduler.weights.all_weighers. Hosts are then weighted and sorted with the largest weight winning. [DEFAULT] io_ops_weight_multiplier Multiplier used for weighing host I/O operations. 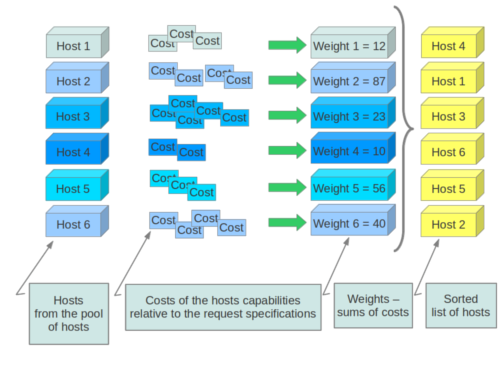 A negative value means a preference to choose light workload compute hosts. [DEFAULT] soft_affinity_weight_multiplier Multiplier used for weighing hosts for group soft-affinity. Only a positive value is meaningful. Negative means that the behavior will change to the opposite, which is soft-anti-affinity. [DEFAULT] soft_anti_affinity_weight_multiplier Multiplier used for weighing hosts for group soft-anti-affinity. Only a positive value is meaningful. Negative means that the behavior will change to the opposite, which is soft-affinity. 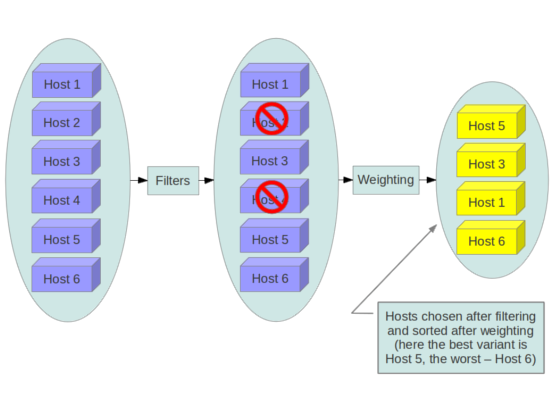 [filter_scheduler] build_failure_weight_multiplier Multiplier used for weighing hosts which have recent build failures. A positive value increases the significance of build falures reported by the host recently, making them less likely to be chosen. [metrics] weight_multiplier Multiplier for weighting meters. Use a floating-point value. [metrics] weight_of_unavailable If required is set to False, and any one of the meters set by weight_setting is unavailable, the weight_of_unavailable value is returned to the scheduler. [cells] mute_weight_multiplier Multiplier to weight mute children (hosts which have not sent capacity or capacity updates for some time). Use a negative, floating-point value. [cells] offset_weight_multiplier Multiplier to weight cells, so you can specify a preferred cell. Use a floating point value. [cells] ram_weight_multiplier By default, the scheduler spreads instances across all cells evenly. Set the ram_weight_multiplier option to a negative number if you prefer stacking instead of spreading. Use a floating-point value. [cells] scheduler_weight_classes Defaults to nova.cells.weights.all_weighers, which maps to all cell weighers included with Compute. Cells are then weighted and sorted with the largest weight winning. As an administrator, you work with the filter scheduler. However, the Compute service also uses the Chance Scheduler, nova.scheduler.chance.ChanceScheduler, which randomly selects from lists of filtered hosts. Host aggregates are not explicitly exposed to users. Instead administrators map flavors to host aggregates. Administrators do this by setting metadata on a host aggregate, and matching flavor extra specifications. The scheduler then endeavors to match user requests for instance of the given flavor to a host aggregate with the same key-value pair in its metadata. Compute nodes can be in more than one host aggregate. Administrators are able to optionally expose a host aggregate as an availability zone. Availability zones are different from host aggregates in that they are explicitly exposed to the user, and hosts can only be in a single availability zone. Administrators can configure a default availability zone where instances will be scheduled when the user fails to specify one. Create a new aggregate named <name>, and optionally in availability zone [availability-zone] if specified. The command returns the ID of the newly created aggregate. Hosts can be made available to multiple host aggregates. Be careful when adding a host to an additional host aggregate when the host is also in an availability zone. Pay attention when using the nova aggregate-set-metadata and nova aggregate-update commands to avoid user confusion when they boot instances in different availability zones. An error occurs if you cannot add a particular host to an aggregate zone for which it is not intended. Update the name and availability zone (optional) for the aggregate.